Elvex Quattro™ industrial reusable ear plugs feature a stiff insertion stem and a tapered four-flange design to fit most users. Also available in corded. Elvex Quattro Reusable Ear Plugs (NRR 27, SNR 34)5Rick FreebornJuly 11, 2018Very good ear plugs. Fit is perfect. Would purchase these again! Elvex Quattro Reusable Ear Plugs (NRR 27, SNR 34)5apexalOctober 29, 2016I've been using these ear plugs for a couple years now when I ride my motorcycles. I find them to be easy to put in, comfortable, long lasting and very effective in keeping the noise out. I used to get them at work but they became unavailable. Luckily I found The Earplug Superstore and since their price was so good I ordered 12 pairs! Great earplug and great company to do business with! Elvex Quattro Reusable Ear Plugs (NRR 27, SNR 34)5JoeSeptember 26, 2015They seem to be the best fitting ear plugs I could find. They last about 2 months before they permanently compress to the shape of your ear, at which point it's too hard to get them them to seal to your ear. 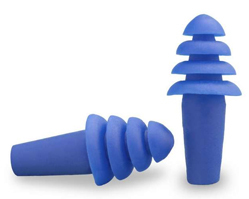 Elvex Quattro Reusable Ear Plugs (NRR 27, SNR 34)5RandallApril 9, 2015I use these when target shooting. They're well made, comfortable, and, most importantly, they work. Elvex Quattro Reusable Ear Plugs (NRR 27, SNR 34)5Darren Ricchi, BC-HISSeptember 26, 2012As an avid target shooter and Hearing Specialist, these are the only non-custom earplugs I use and recommend to my patients. They're reusable, comfortable, and well made. A great product. Elvex Quattro Reusable Ear Plugs (NRR 27, SNR 34)5Bill Donovan MDNovember 23, 2011These are fine for those with normal to large canals, but one of my canals is smaller, requiring a smaller plug. Thus one has to mix and match.